When it comes to moving and storage, Zippy Shell has built a reputation for providing dependable, high-quality service. In fact, our relocation sales have gone up 350 percent (which makes it a record quarter for us) thanks to our commitment to making sure that clients are fully satisfied with our moving and storage services. Zippy Shell has received recognition for the services we offer. 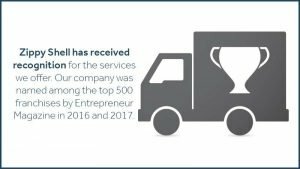 Our company was named among the top 500 franchises by Entrepreneur Magazine in 2016 and 2017. The Franchise Times also included our company on the Top 500 Franchise Systems list. These awards reflect our dedication to providing exceptional service. When you rely on Zippy Shell, you can count on receiving reliable service getting ready for your move, during your move and afterward if you end up needing to store items. Whether you need moving services, storage services or both, Zippy Shell offers convenience and quality. With our services, you don’t have to worry about dealing with disreputable moving companies, sketchy storage facilities, or any co-mingling with others’ stuff at storage facilities. Our crew members provide you with outstanding service that helps make moving or storing items as stress-free as possible. Our moving services bring a Zippy Shell storage container to you so that you can pack it up with your boxes and other items before your move. You can also have our crew pack up your boxes, for even greater convenience. Long distance/inter-state moves to your new home can be accomplished in as few as seven to ten business days, while also receiving up to thirty days of free storage during your move. You’ll have three days to take your time unloading your boxes, or you can have our crew do it for you. Our storage services take the stress out of keeping your belongings safe and out of the way. We bring a Zippy Shell storage container to you, and give you up to three days to get it loaded. Our shells are all street legal, which means you don’t have to worry about having it parked at the curb in front of your home while you load. When your items are packed inside your locked container, we’ll take your container back to our secure, climate controlled warehouse facility. We offer a variety of storage services, including residential, commercial, student, military and realty services. Coming soon – we will also be offering onsite container storage at your location, for as long as you need it! If you would like more information and details on our moving and storage service, please contact Zippy Shell Greater Columbus. We can make your move as easy as possible and provide you with a safe place to store your items. Call us to learn more about our services, or to reserve your storage shell. We look forward to helping you with all of your moving and storage needs.